How to Become a Bollywood Actor in India ? Hello Guys, How to Become a Bollywood Actor in India ? this is the most searchable question nowadays from the youngsters around the globe. 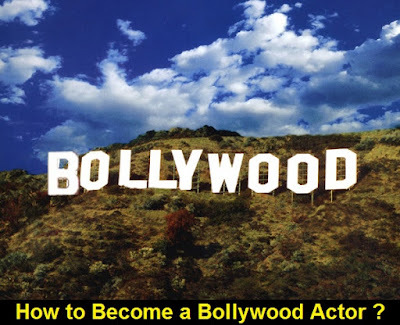 People who have dream to get into Film Industry and act in the movies should go through the article which discuss regarding how you can become a Bollywood actor. As many new faces are been seen in the Bollywood so people are having craze to be one of them. Getting into Bollywood needs a lot of struggle, hard work, confidence, discipline towards your work and patience as good things always take time to happen. We can only show you the way how you can get into Bollywood its all up to you and your hard work which will help you to make a actor. So just go through the steps below and try to know how you can easily get into Bollywood movies. Feel free to share your views in below comments. Getting in Bollywood is not a hand to mouth thing you need to work a lot on your personality and with various things which can only help you to become a Bollywood actor. So guys checkout the steps below which will surely help you to make your dream come true. These are the steps which are the most important to get into Bollywood listed below. Your body plays a very important role to become a Bollywood actor. We all love to see Salman khan's movie all because of his personality which shocks us and make us to watch the movie. So guys you need to work on your body first you have to be in a good shape to impress the people around you. As first impression is all about so you need to be having a amazing personality. If you are not in a good shape just start with a gym and with a proper diet to get the proper body. Looks which is also the most important thing which can give you the most simplest and easiest entry into the Bollywood. As looks are the things which can attract the people to cast you in their movies. If you have great looks your half work is done already and you just need to focus on your acting skills. So guys looks matter a lot the way you dress up, your hairstyles everything which matters a lot to become a actor. Friends, If you are damn serious to make your career in Bollywood you need to take guidance to improve your acting skills which can only make you a star for longer period. If people are liking your work they will be surely be your fan for a longer period. So you need to learn about acting and everything about it so joining some acting class will surely a right decision. There are many actors who have their own acting schools like Anupam Kher's Actor preparation school in Mumbai which generally have tie ups with directors and producers so you can also have a direct chance for Bollywood if you perform amazingly. With all the above things mentioned a actor should also know how to dance! You should have some skills regarding dance too. If you are good in dance too your entry into the Bollywood is quite easy than others. You can also join some classes to learn the act of dancing. If you can afford you can also join the dance class of famous choreographer and Dance Indian Dance judge Terence Lewis at Mumbai which can be beneficial for your entry in Bollywood and Live dance shows. You also have many other options to become a Bollywood actor you can start with modelling. This will surely help you to take your career to the next level which is advertisement, Photo-shoots, albums etc. And from modelling you can enter into Mr India contests and become famous which is also a direct way to your Bollywood journey. You can have a live example of Deepika Padukone, Aishwariya Rai Bachan, Priyanka Chopra and many more who started that career as an modelling and now are leading actors and actress in Bollywood. Auditions are the starting step for you to get into Bollywood. You will come across many failure or even worst than that but don't give up. Starting days are always the harder once. There are many actors in the Industry today who had struggled a lot to become what they are today. Go for each and every auditions you come across. And if you get any of the role whether its for 1-2 minutes just try to give your best in those minutes which can surely help you to become a actor. There are many actors in Bollywood who have came from a very short role in movies like Nawazuddin Siddiqui. Your network plays a very important role to get into Bollywood. You need to have a friend circle who are very much into Bollywood industry. You network can take you where you have not imagined yet. For this you need to meet new people, go in social meetings, parties where you can get to meet this people which will surely help you a lot for boosting your career and opening doors for for you. We don't need to give you a vast description for this as every one knows how important reality shows are to increase your popularity among people to make you become a actor. There are various reality shows which can change your life and make your dream come true like roadies, splitsvilla, dance shows, singing shows etc which have given Bollywood industry a lot of new talents and still doing it. So you may try your luck by participating in those shows where you fit the best and travel the journey of your dreams. Yes its one of the most essential thing which can only help you to become a Bollywood actor. You will face a lot of struggle , ups and downs in life but your attitude towards it will decide how important it is for you which will surely help you to get into film industry. Your never give up attitude will take you to the next step of your journey. So this was all about How to Become a Bollywood Actor in India ? Hope you liked our article. Guys this article is only a way to reach to your dreams but in reality you need to go through a lot of hard times and be confident about your self. You need to understand yourself that do fir to become a actor there a lakhs of people who daily visit Mumbai to try their luck in the film industry and only few of them succeed so you need to have acting skills to survive in the Bollywood. same There are many actors who have acted but not seen till now because of their poor acting and at the way their are some who have a huge fan following all over the world like Sharukh Khan, he can make people fall in love with him his acting and love towards his work have made him from no one to some one. So you need to understand well what is right for you and just chase your dreams if you think you are best in it if not just focus on things which can make you feel better in life . For any critics or questions regarding How to Become a Bollywood Actor in India ? feel free to comment below.